The Seal and Armorial Bearings of Bihać town from the 14th century. 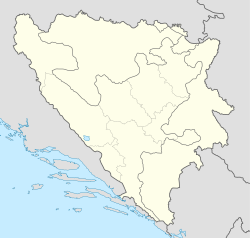 Bihać (Cyrillic: Бихаћ; pronounced [bǐxaːt͡ɕ]) is a city and the administrative center of Una-Sana Canton of the Federation of Bosnia and Herzegovina, an entity of Bosnia and Herzegovina. 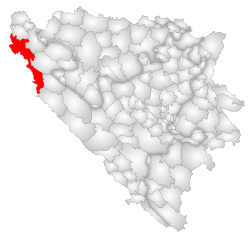 It is situated on the banks of river Una in northwestern Bosnia and Herzegovina, in the Bosanska Krajina region. As of 2013, it has a population of 56,261 inhabitants. 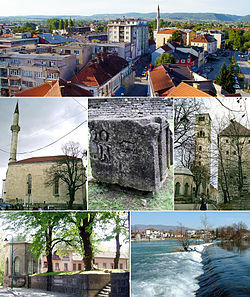 According to the 2013 census, the city of Bihać has a population of 56,261 inhabitants. The agricultural sector is significant, due to the large and fertile soil. ^ "POPIS STANOVNIŠTVA, DOMAĆINSTAVA I STANOVA U BOSNI I HERCEGOVINI, 2013. REZULTATI POPISA" (PDF). popis2013.ba (in Serbian). Retrieved 9 May 2018. ^ "Meteorlogical data for station Bihać in period 1961–1990". Meteorological Institute of Bosnia and Herzegovina. Archived from the original on 1 May 2018. Retrieved 30 April 2018. Wikimedia Commons has media related to Bihać.